The Rainbow Serpent continues to lead me on, deepening my ability to commune with the Earth. And the humpback whales continue to teach me about streaming my rainbow colors as I walk through life. If you've been following my journey then you will remember the Prayer Stick that I made for 2017 and how while I was filming it, energy poured through me, causing it to dance. During my shamanic journeying class with Sandra Ingerman during Jan.- March, 2017, I had several journeys in which the Rainbow Serpent appeared. 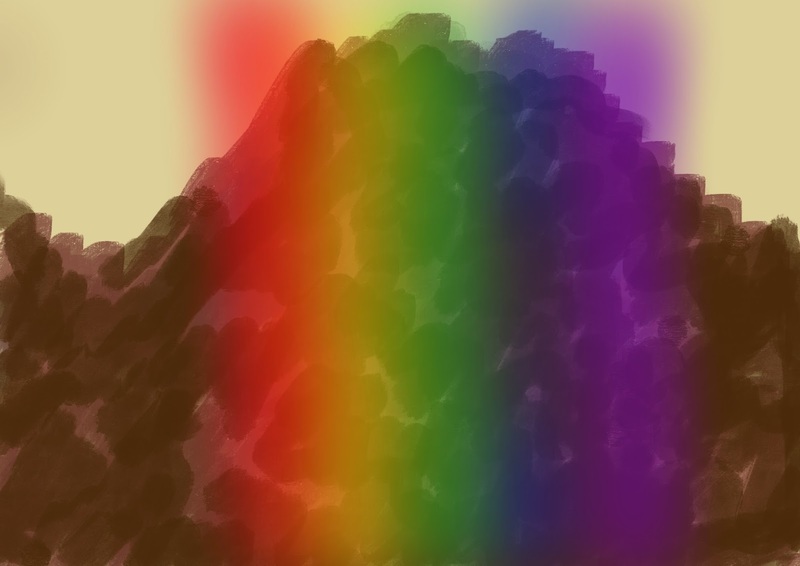 After I ceremonially “sang” three women up on the top of Mauna Kea during the time of the April New Moon, my Huna friend, Iliana told me that the singing had brought rainbow colors that were flowing into the mountain. The day after the ceremony, it suddenly felt like what needed to be done on the Big Island was complete, and tuning in, was guided to go to Kauai, where very Ancient energies made themselves known to me at sacred Anahola. It felt like I was being downloaded with energies and memories that connected me to the very deep ancient times when the planet was being formed. After 10 days and a surprisingly and extremely peaceful and very quiet Full Moon, I realized I was complete with what needed to happen on Kauai and discovered that we were now to return to the Big Island. It felt like the ancient energies of Kauai accompanied me and I heard, “From the oldest to the youngest.” That we were transferring energy from the oldest island to the youngest. Rainbow colored energy has definitely been a big part of my experience here on the Big Island. Returning after the visit to Kauai, I finally got to see Rainbow Falls when the rainbow was actually happening. I have spent most of my time during this second visit up at Volcano, witnessing the amazing sight of the lava dancing whenever the lava lake rises to a height where the surface can be seen from the museum. I thought to myself wouldn’t it be wonderful to see a rainbow that touched into the crater and a couple of days later, there it was! At first it looked like an ordinary rainbow, but then it formed a very intricate layer of colors within the outer rainbow (you can barely see them in the video, but they were absolutely awesome) and then added a whole other separate arc to form a double rainbow. Exquisitely beautiful. I’ve seen lots of rainbows in my life, but I’ve never seen anything like this one. Truly magical. Truly a blessing! Discovering the rainbow-colored, sparkling lava stones has been a huge gift and I have made several trips out to visit them. Their abundance started me looking for sparkles everywhere and am finding that when I look, I find them in the most amazing places. My camera is unable to catch it, but when you walk around near the Kilauea outlook there is volcanic glass (called Pele’s hair) everywhere that sparkles in the sunshine. The Rainbow Serpent continues to call to me onward. This time to come visit. I leave the Big Island for Uluru (Ayers Rock in Australia) this coming Tuesday, May 30th.